Definition: A ‘quadrilateral’ is a geometric figure on a plane enclosed by 4 line segments. BAD and BDC with BD as common base..
Sides have a common vertex. Sides do not have a common vertex. Angles have a common side. Angles do not have a common side. We notice that the sum of all four interior angles in a quadrilateral is 3600. Can we prove this mathematically? 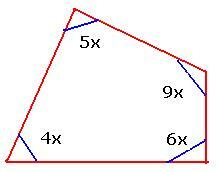 6.7.1 Problem 1:.The four angles of a quadrilateral are in the ratio of 4:5:6:9. Find all the angles. The sum of all angles in a quadrilateral is 3600. Since the angles are in the ratio of 4:5:6:9, let they be 4x, 5x, 6x and 9x. 6.7.1 Problem 2: If the angles of a quadrilateral are 3x, 3x+150, 3x+300 and 900.Find all the angles. We have seen earlier that a triangle totally has six elements (3 sides and 3 angles). We have also learnt to construct triangles with just three elements given (3 sides, 1 side and 2 angles, 2 sides and 1 included angle). Note: With just three angles we cannot construct a unique triangle. Compared to a triangle, quadrilateral has 10 elements (4 sides, 4 angles, 2 diagonals). We cannot draw a quadrilateral uniquely with 4 elements. We need at least 5 elements to draw unique quadrilaterals. However, it will not be possible to construct a unique quadrilateral with 1 side and 4 angles. We need any one group of the following set of elements, to construct a unique quadrilateral. From the above point, draw an arc of given radius (length of the side) to cut this line to get the required side. b) Use protractor to construct angles of required measure, wherever required. Step 2: Follow the steps described above (a,b), to construct sides/angles of required measure. From B, draw an arc of radius 4cm to cut the above line at D ( DAB= 600, BD=4cm). Join DC. First draw a rough diagram. From S, dawn an arc of radius 2.5cm. From Q, dawn an arc of radius 3cm to cut the above arc at R(SR=2.5cm,QR=3cm). Join SR and QR. 6.7. 1 Exercise: In Table 6.7.1 we have listed seven combinations of data required for construction of a quadrilateral, out of this we constructed quadrilateral of three combinations (green color). Construct quadrilaterals with the four remaining combinations of data (yellow color). 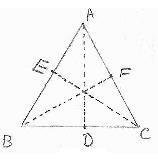 In the adjacent figure of triangle ABC, AD, BF, CE are altitudes to the bases BC, AC and AB respectively from the opposite vertices A,B and C respectively. We are going to prove this formula for calculation of area of triangle in section 6.8.7. We have seen that a diagonal of a quadrilateral cuts the quadrilateral in to 2 triangles. We shall use this Property to calculate the area of a quadrilateral, as we already know how to calculate the area of a triangle. Let PQRS be the quadrilateral. Draw a perpendicular (QA= h1) to PR from vertex Q. Draw another perpendicular (SB=h2) to PR from vertex S. h1 and h2 are altitudes of PQR and PRS. 2. Non parallel sides are equal. 2.Pairs of consecutive angles at the end points of the two parallel sides are equal. 2. Diagonals bisect each other. 3. Diagonals are | to each other. 3. Diagonals bisect each other. 4. Diagonals are | to each other. The reason we will learn later (Section6.8.2) is that the area of a rectangle (base*another side) is greater than the area of parallelogram (base*height) when their sides are of same measures. 6.7.4 Problem 1: Two consecutive angles of a parallelogram have measures, (x+30) and (2x-60) respectively. Find the measures of all angles. 6.7.4 Problem 2: In a parallelogram ABCD, DAB= 700, DBC = 800 Find CDB and ADB. 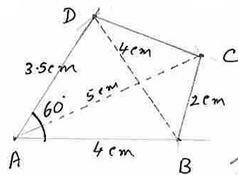 Since in a parallelogram opposite angles are equal, BCD = 700. So the angles are 700, 1100, 700 and 1100. 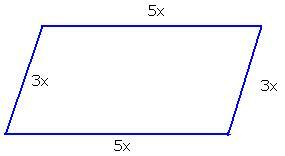 6.7.4 Problem 3: The ratio of two sides of a parallelogram is 3:5 and the perimeter is 48cm. Find the sides of the parallelogram. Hence the sides are 9cm, 15 cm, 9 cm and 15cm. Perimeter = sum of all sides = 9+15+9+15 = 48cm, which is as given in the problem and hence our solution is correct. Note: Though this has come to be known as Heron’s formula, ‘Bhaskara’ had provided the proof of this in his book (‘Leelavati’- shloka 169). 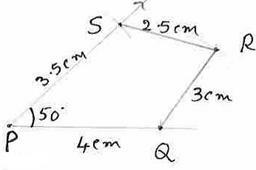 6.7.2 Problem 2: Find the area of a triangular park whose sides are 18m, 24m and 30m. Also find the length of the altitude corresponding to the largest side of the triangle. Let a=18, b=24 and c=30. 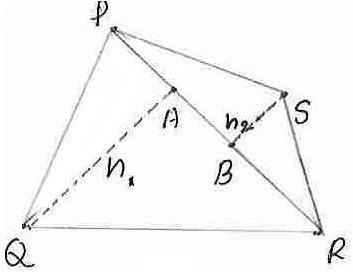 Since the largest base is 30, let the height on this base be h.
Note: Heron’s formula is very helpful if we have to calculate the area of a quadrilateral given its sides and a diagonal, as in the problem given below. 6.7.2 Problem 3: A floral design on a floor is made up of 8 tiles which are quadrilaterals. Its sides are 9cm, 28cm, 9cm and 28cm and it’s diagonal is 35cm as shown in the adjoining figure. Find the cost of polishing the tiles at the rate of 50paisa per sq.cm. The sides of the triangle are a=28, b=9 and c=35. Area of a tile = 2*area of triangle = 176.4 sq.cm. Total area to be polished = number of tiles * area of a tile = 8*176.4 = 1411.2 sq.cm.